My go-to Christmas cookie is my sugar cookie - everyone tells me how delicious they are. I find that making a soft and almost melt-in-your-mouth sugar cookies with rum-vanilla icing make people salivate after the first one, and I won't exaggerate. I *always* get asked for more. So...that was/is my priority cookie. However, a few days after Christmas, I made my most favorite cookie: Chocolate Crinkles. My mom used to make them every year for Christmas, and this annual tradition has been passed along to me. They're so good! As much as I love really sweet cookies, these have more of rich cocoa flavor with a hint of sweet. Yum. Chocolate crinkles are another type of rolled cookie that requires some refrigeration before baking. Once you make the dough, it needs to chill in the fridge for about two hours. 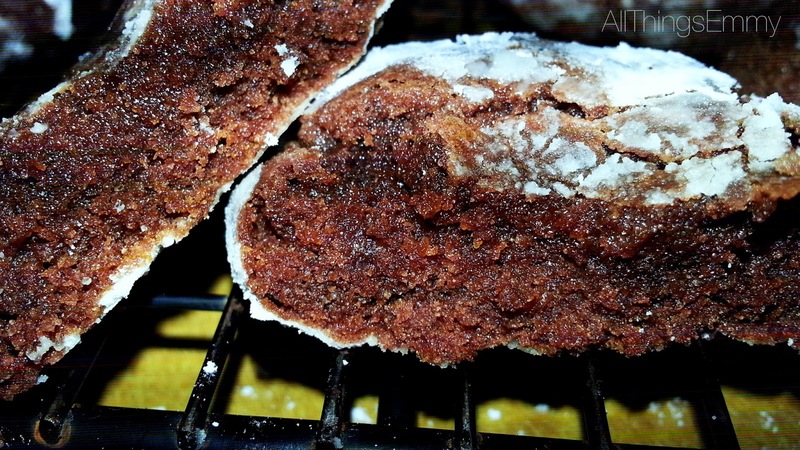 Once chilled enough, you grab little bits of the dough, roll it into balls with your hands, and drop them into powdered sugar before transferring to the cookie sheet. An ooey-gooey chocolate core with a slightly chewy exterior with melted powdered sugar makes these confections to-die-for.